In 2011 queer (gay, lesbian, bisexual and transgender) youth groups initiated a letter-writing campaign to Prime Minister John Key as a national protest against bullying of queer youth. Letter writers were encouraged to include their own experiences of bullying to show how if affected their lives. The aim was to send these letters on Pink Shirt Day (14 April), which raises awareness of bullying. Over 3,000 letters were received by the prime minister's office. 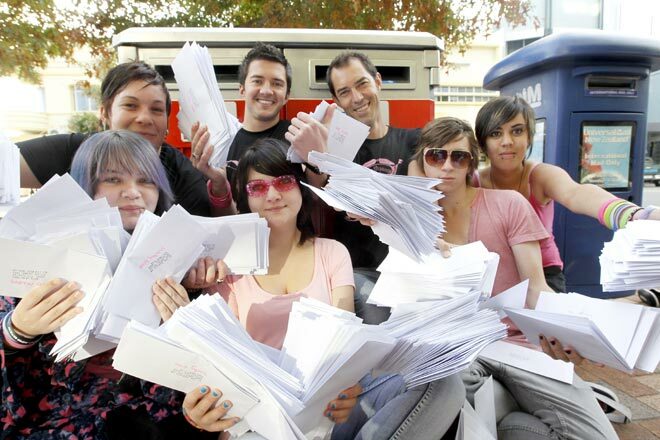 These young people in Nelson hold some of the letters ready for posting.